One of the main problems for even the most talented young singer is how to get his or her career started. There are many places where a solid training is given: the Glenn Gould School at the Royal Conservatory or the music faculties or departments at our Universities, such as Toronto and McGill, York and Western Ontario. Then there are opportunities for further training through the mentorship program at Toronto Summer Music or the Opera Division at the University of Toronto Faculty of Music, the Ensemble Studio of the Canadian Opera Company or the Atelier lyrique de l’Opéra de Montréal. In a number of cases such participation has led to important professional engagements. This season, for instance, we were able to hear several recent graduates of the Ensemble Studio in major roles at the COC: Ileana Montalbetti sang Ellen Orford in Peter Grimes, Simone Osborne performed Musetta in La bohème and Oscar in Un ballo in maschera. In the recent Tafelmusik performances of Handel’s Saul, the part of Saul’s daughter Michal was sung by Sherezade Panthaki, an alumna of the Tafelmusik Baroque Summer Institute. And there are always competitions: the North York Concert Orchestra (NYCO) recently announced the winners of the 2013/14 Mozart Competition: Leigh-Ann Allen and Natalya Matyusheva, soprano, Lauren Phillips, mezzo, and Keith Kam, baritone. They will sing with NYCO on May 31. Chances like those do not come easily, though. One way of getting started, employed by many singers, is to perform as soloists with amateur choirs. For the last two years I have been singing with the Oakham House Choir of Ryerson University and one of the pleasures of doing so has been getting to hear a number of fine young soloists. In the first concert that I sang we did Mozart’s Coronation Mass. The tenor was Andrew Haji, whom I had just heard at the annual competition for the COC Ensemble Studio, in which he won Second Prize. At the dress rehearsal of our concert I approached Haji and said what a privilege it was for our choir to sing with such fine soloists. He did not miss a beat and replied that it was a privilege for them to sing with such a fine choir. I wondered then how literally I should take his answer but I decided in the end that it was a courteous comment from a man with a very quick mind. This spring’s concert by the Oakham House Choir on April 26 at the Calvin Presbyterian Church features the soprano Kasia Konstanty in Handel’s Ode for St. Cecilia’s Day and Karl Jenkins’ Gloria; accompanying the choir, Matthew Jaskiewicz conducts the Toronto Sinfonietta. Konstanty studied music at McMaster University and then as a graduate student at Western. 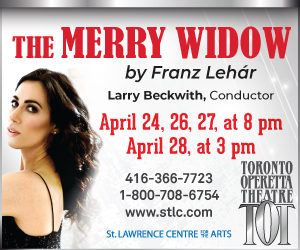 She has sung as a soloist in a number of concerts, many of them for Polish-Canadian organizations. You can preview her luminous soprano on YouTube, where she sings “Je veux vivre” from Roméo et Juliette by Gounod. There are similar opportunities with other choirs: on April 5, the Etobicoke Centennial Choir will perform a varied program (Franck, Mozart, Schumann, madrigals), in which the soloists are Jo-Ann Dawson, soprano, Olga Tylman, alto, Keenan Viau, tenor, and Christopher van Wyck, baritone at the Humber Valley United Church, Etobicoke. Other Events in the GTA: In a free noontime concert on April 3 Claire de Sévigné, soprano, Charlotte Burrage, mezzo, Andrew Haji, tenor, and Gordon Bintner, bass-baritone, will sing Brahms’ Liebeslieder Walzer. The pianists are Liz Upchurch and Michael Shannon; at the Richard Bradshaw Amphitheatre. In 1726 Handel was much inconvenienced by the rivalry between his leading sopranos, Francesca Cuzzoni and Faustina Bordoni. On April 9, 10, 12 and 13 Isabel Bayrakdarian will present music sung by both of the rival queens. The program will include not only music by Handel but also arias by Hasse and Bononcini as well as works by Telemann and Zelenka. Bayrakdarian will be accompanied by Tafelmusik, directed by Jeanne Lamon at Koerner Hall. On April 11 a concert jointly organized by Opera by Request and the Canadian Institute for Czech Music will include Biblical Songs and Love Songs by Dvorak and Mahler’s Das Lied von der Erde as well as selections from Das Knaben Wunderhorn. The soloists are Danielle Dudyucha, soprano, Jenny Cohen and Kristine Dandavino, mezzo, Dillon Parmer, tenor, and John Holland, baritone at the College Street United Church. On April 12 at Metropolitan United Church, Bach’s B minor Mass will be performed jointly by the Amadeus Choir and the Elmer Iseler Singers. The soloists are Meredith Hall, soprano, Catherine Wyn-Rogers, mezzo, Colin Ainsworth, tenor, and Nathaniel Watson, bass-baritone. The conductor is Lydia Adams. Music at Metropolitan presents Bach’s St. John Passion on April 18 (Good Friday). Charles Davidson will be the Evangelist and Clarence Frazer the Christus. The arias are sung by Lesley Bouza, soprano, Daniel Taylor, countertenor, Christopher Mayell, tenor, and James Baldwin, baritone. The conductor is Patricia Wright. At the Canadian Music Centre, April 25, Matthew Zadow, baritone, with Dina Namer, piano, will perform songs by Branscombe, Coulthard, Morawetz, Daly, Mercure, Martin, Pépin and others. Also on April 25, at Koerner Hall, the mezzo Beste Kalender will sing R. Murray Schafer’s Adieu Robert Schumann with the Royal Conservatory Orchestra conducted by Uri Mayer. The concert will also include music by Debussy and Brahms. On April 25 and 26 the Toronto Masque Theatre will explore the myth of Europa as presented in a baroque cantata by Monteclair and in a new work by James Rolfe. Suzie LeBlanc is the soprano soloist at Trinity-St. Paul’s Centre. Music inspired by love will be performed by the Toronto Symphony Orchestra with Yulia Van Doren, soprano, and Wallis Giunta, mezzo; arias and duets by Mozart, Offenbach and Delibes at Roy Thomson Hall, April 26 and 27. On May 4 at Glenn Studio, Off Centre Music Salon will present music by Rachmaninoff, Medtner, Gretchaninov and Rebikov. The singers are Erica Iris Huang and Michèle Bogdanowicz, mezzo, Edgar Ernesto Ramirez, tenor, and Peter McGillivray, baritone. And beyond the GTA: On April 12 at West Highland Baptist Church, Hamilton, the mezzo Jennifer Enns Modolo will perform with the Mohawk College Community Choir, Fanshawe Chorus and the Redeemer University Sinfonia. The program will include Stabat Mater by Jenkins, Nänie by Brahms and Eclogue by Finzi. There will be a performance of Handel’s Messiah by the Nota Bene Baroque Players with soloists Agnes Szigovics, soprano, Daniel Taylor, countertenor, Michael Schade, tenor, and Sean Watson, bass-baritone April 12 and 13 at the First United Church, Waterloo. The April 12 performance is a Sing-Along Fundraiser. On April 18 the Georgetown Bach Chorale features baritone Bob Knight in Fauré’s Requiem and in Five Mystical Songs by Vaughan Williams at St. George’s Anglican Church, Georgetown. Also on April 18, at Centre in the Square, Kitchener, the Grand Philharmonic Choir and the Kitchener-Waterloo Symphony perform Bach’s St. John Passion with Colin Ainsworth as the Evangelist and Geoffrey Sirett as the Christus. The arias will be sung by Melanie Russell, soprano, Lauren Segal, mezzo, and Daniel Lichti, bass. A Postscript: I was much taken with the recent concert performance of Gagliano’s Dafne, jointly produced by Capella Intima and the Toronto Continuo Collective. It featured six singers and an orchestra consisting of lute, baroque guitar, archlute, four theorbos, viola da gamba and harpsichord. Seven plucked instruments! I asked Bud Roach, the director of Capella Intima, what the difference was between an archlute and a theorbo. He said it was about $3,000.